The Buon Vino Superjet filters 1 gallon of wine per minute. It is a must-have for large-scale winemaking! 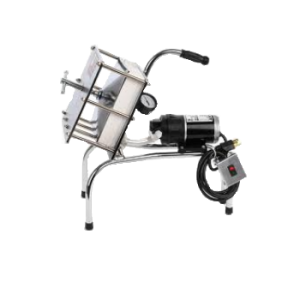 Ideal for clarifying any wine giving it the brilliance and sparkle that previously was only achieved in commercial wines the Buon Vino SuperJet is a professional advancement in home wine making made easy. It has been designed with ease and quality in mind. Wine is drawn by means of a self-prime pump into the plastic filtering plates which house the filter pads. The specially designed grooves on the plastic filtering plates direct the wine through the filter pads allowing the unit to achieve optimum filtering capability. Pre-Filter large particles using the pre-filter (sold separately) to extend pump life for best results. Technical Specifications: Self-priming pump; filter surface 1200 square cm; 3 grades of pads (purchased separately) Coarse Polish (1 micron) and Sterile (.5 micron).